AGE is a peculiar concept. We tend to think of it as the number of birthdays we have celebrated - our chronological age. But this is just one indicator of the passage of time. We also have a biological age, a measure of how quickly the cells in our body are deteriorating compared with the general population. And these two figures don’t always match up. Just take a look around: we all know people who look young for their age, or folks who seem prematurely wizened. Even in an individual, different parts of the body can age at different speeds. 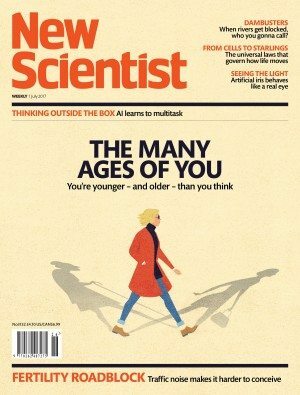 By examining how chronological age lines up with biological age across the population, researchers are starting to pin down how these two measures should sync up - and what it means for how long we have left when they don’t. In recent years, studies have shown that our biological age is often a more reliable indicator of future health than our actual age. It could help us identify or even prevent disease by tracking the pace at which we’re getting older. It may even allow us to slow - or reverse - the ageing process. I became interested in my biological age after discovering in my 20s that my ovaries were ageing prematurely. Yet now, at 33, I am still often asked for identification when buying alcohol, suggesting my face is holding up pretty well. It made me wonder about other aspects of my biological age, and whether knowing more might help me to live a longer, healthier life. So, I set out to answer the question: How old am I really? 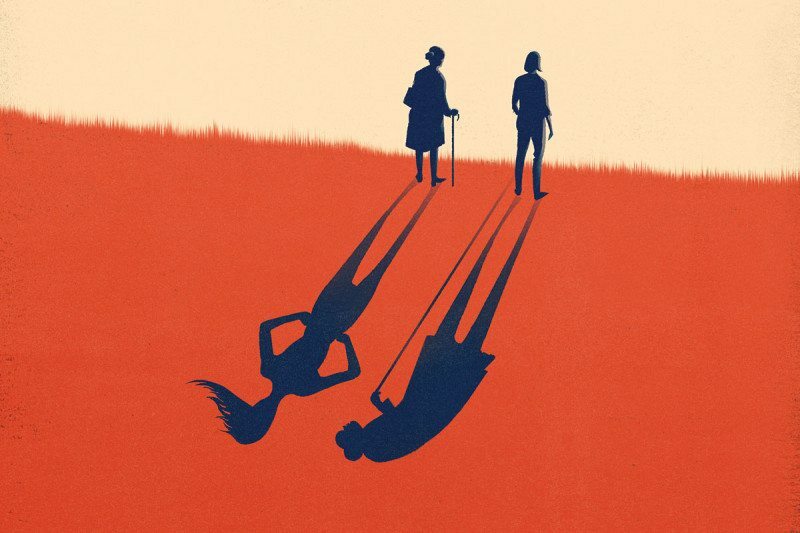 Ageing is the progressive loss of function accompanied by decreasing fertility and increasing mortality, according to Thomas Kirkwood from the Institute for Ageing at the University of Newcastle, UK. Surprisingly, it’s not universal across species. The Turritopsis dohrnii, or “immortal jellyfish“, can revert to a larval state and turn back into an adult indefinitely, for instance. We don’t have that luxury. According to the UK Office for National Statistics, I can expect to live to 83. "A new idea suggests ageing is a byproduct of how energy intensive it is for our bodies to repair faults"
The most widely cited theory of ageing is that telomeres, genetic caps on the ends of chromosomes, grow shorter each time a cell divides - like a wick burning on a candle. Once these are used up, the cell withers and dies. But a new idea gaining ground suggests ageing is instead a byproduct of how energy intensive it is for our bodies to continuously repair faults that occur in our DNA as cells divide. “It doesn’t make evolutionary sense to maintain that process for ever,” says Kirkwood. Indeed, several animal studies have shown that genes that affect lifespan do so by altering cells’ repair mechanisms. Little by little, faults build up in cells and tissues and cause us to deteriorate. Still, a growing number of researchers have taken up the challenge. Before seeking them out, however, I began to wonder whether I could be in for a nasty surprise. When Daniel Belsky and his team at Duke University in North Carolina studied 18 different markers of cellular ageing - including blood pressure and cardiovascular function - in almost 1000 adults, they found that some were ageing far faster or slower than their birth certificates would suggest. One 38-year-old had a biological age of 28; another’s was 61. So if I have an accelerated biological age, does it mean I’m less likely to make it to 83? Studying humans until they die takes a long time, so the causal relationship is tricky to pin down. But an increasing number of studies suggest this is a fair assumption. Belsky’s team found that 38-year-olds with an older biological age fared worse on physical and mental tests, for instance. And when James Timmons and colleagues at King’s College London examined expression of 150 genes associated with ageing, they found that biological age was more closely tied to risk of diseases such as Alzheimer’s and osteoporosis than chronological age. The algorithm was developed using a population of Han Chinese people and so far has only been tested in four caucasians. So, as a white woman, I had my face analysed by a similar algorithm designed by anti-ageing company Youth Laboratories in Russia. The result was a win for me: I apparently have the face of a 25-year-old. "The result was a win for me: I apparently have the face of a 25-year-old"
Lauc and Tim Spector, a genetic epidemiologist at King’s College London, founded GlycanAge - a company that tests people’s glycan levels - and kindly tested mine for free. It turns out my glycan age is just 20, a whopping 13 years younger than I am. With a new spring in my step, I moved on to what is now considered the most accurate way to measure human ageing: an intrinsic “epigenetic” clock present in all our cells. Epigenetics refers to the process by which chemical tags called methyl groups are added to or removed from DNA, which in turn influences which genes are switched on or off. Some changes in methylation patterns over time can be used to estimate age. Horvath is also interested in discrepancies between our chronological age and epigenetic clock, which diverge most drastically in cancer tissue. Trey Ideker, a medical researcher at the University of California, San Diego, and his colleagues discovered that the epigenetic age of kidney, breast, skin and lung cancer tissue can be almost 40 per cent older than the person it came from. "It sounds like science fiction… but in theory it’s possible to reset the clock"
Beyond monitoring and aiding diagnoses for diseases, can any of these measures give us a better idea of how much life we have left? There is an association between our epigenetic clock and our time to death, but it’s not very accurate - yet. In his analyses, Horvath found an association between accelerated epigenetic ageing - an older epigenetic age compared with your real age - and time to death. Around 5 per cent of the people he studied had an accelerated epigenetic age. Their risk of death in the next decade was about 50 per cent higher than those whose epigenetic age lined up with their actual years. Another promising, if speculative, plan might be to freeze blood stem cells when you are young so that you can use them to reconstitute your immune system when you are old. 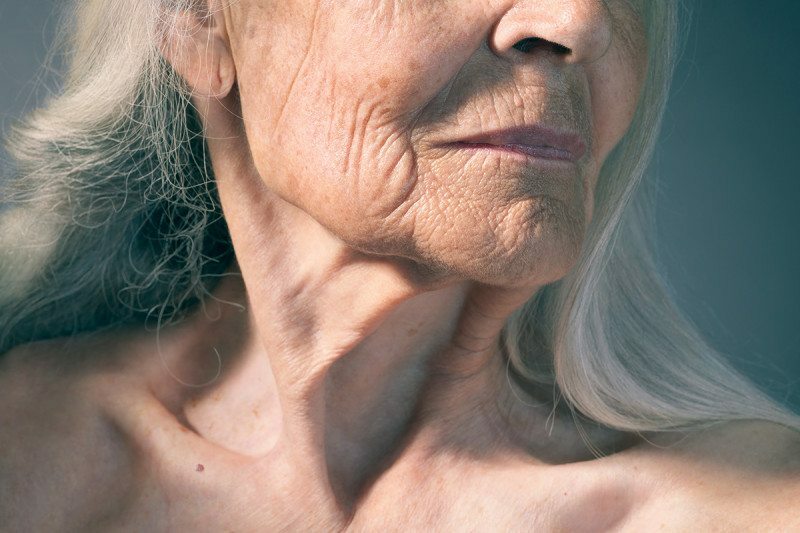 There is still a long way to go before we can pinpoint the exact ways to reverse ageing. But for now, I’m relieved to know that most of my body is younger than my years would suggest and, in the not too distant future, knowing my biological age could hold the key to preventing disease or even postponing death. I’ll happily celebrate turning 34 in the knowledge that my age really is just a number. Just like the rest of our body, the brain can sometimes age quicker than we do (see main story). Now researchers at Imperial College London have a way to find out how old the brain really is. James Cole and colleagues trained a computer algorithm to estimate age based on brain images from 2001 healthy people, then tested it on a new group of people to see how old their brains seemed to be. They found that people whose brain age was older than their chronological age had poorer lung function, slower walking speed and an increased risk of death. Those with older brains also performed worse on tests of logic and pattern recognition. What makes the brain age prematurely? High blood pressure, smoking and high cholesterol seem to accelerate brain ageing, possibly by affecting the blood vessels that carry oxygen and essential nutrients. Long-term stress has also been shown to speed up memory loss in older adults. And shift work has a big impact: more than 10 years of shift work can accelerate brain age by around 6.5 years. Exercise seems to be key to mitigating these harms. The brains of elderly people who regularly exercise look 10 years younger than those who don’t. After taking 3D images of 300 faces, Jing-Dong Jackie Han and colleagues at the Chinese Academy of Sciences, Shanghai, created composite images of people of the same chronological age (about 45) but markedly different facial ages. 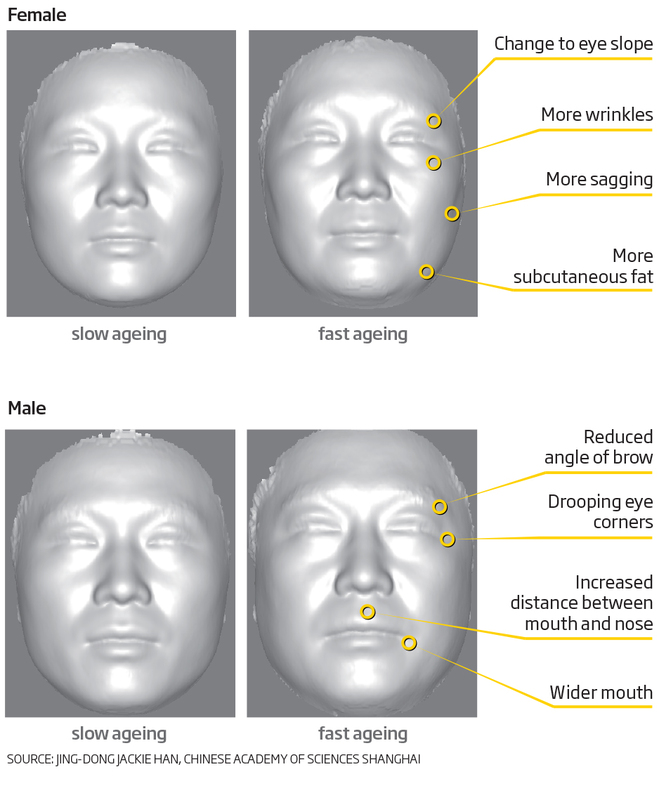 Older looking faces are characterised by more wrinkles, wider mouths and several other factors (see diagram). For most of these things, men and women are equally affected. But there are two notable differences. As men get older, their noses protrude more - something that may have to do with the effect of testosterone on cartilage growth. For women, the buildup of a certain kind of cholesterol can make the face appear more “fleshy”, particularly in the cheeks and under the eyes.